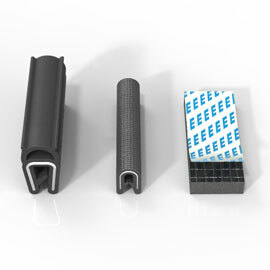 At Hannover Messe Industrie 2018, EMKA shows colour: As customers are increasingly demanding unusual design requirements in addition to functionality and efficiency, EMKA has further developed its quarter turn for quick mounting. 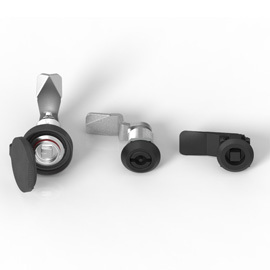 From now on the product is available with a freely designable housing plate. At Stand M07 in Hall 3, EMKA will be demonstrating that this solution can meet almost any customer requirement in terms of design. 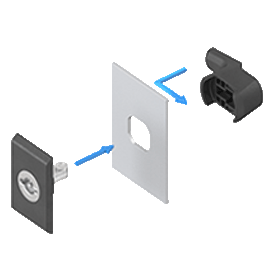 In comparison to the quarter turn for quick mounting by EMKA available up to now, the new version has an outer housing plate. 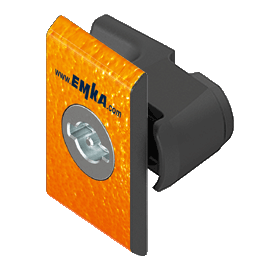 This can be freely designed depending on the customer specifications as EMKA makes the housing plate using the In-Mould-Labelling process. The laminated housing plate can be designed in metal look (e. g. brush-finished stainless steel), carbon look or also with metallic high-polish surface so that impressive, classy surfaces can be realised on the quarter turn. Generally speaking, EMKA can create any design that can be made using the screen printing technique. The design options of the surface are boundless. The free design of the quarter turn surface is also interesting for customers who wish to have the locking solution with their own corporate identity using a motif film (e.g. logo and colour). Others will appreciate it when the quarter turn cannot be told apart from the surrounding area with the naked eye, when it practically merges with the surface. 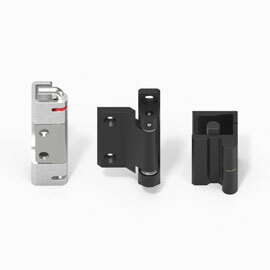 The quarter turn for quick mounting consists of three parts and can be easily mounted within a few seconds. After putting in the insert set into the provided cut-out, the cam is mounted and moved to the side until it catches firmly. 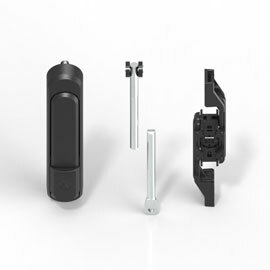 Clip connections of plastic secure the individual components against unintentional disengagement of the parts.